Severn Lodge is one of Ontario Canada’s premier lakeside resorts in the heart of the world famous Muskoka Georgian Bay lake district. For over 150 years the magnificent beauty and serenity of our idyllic Muskoka lake country has attracted vacationers seeking refuge from their daily routine. Here, the air is clean, the water is crystal clear, the stars are bright, and the sunsets spectacular! The resort is approximately 150 km (90 miles) north of Toronto, Ontario, Canada, a short 90 minute drive. It is one of the few remaining traditional historic Muskoka resorts, and has been attracting discriminating leisure and business travelers from around the world for nearly a century. It is also one of the classic Muskoka family resorts in a long history of traditional family operated Ontario resorts. The Lodge is located in the southern part of the Muskoka Lake District near Georgian Bay and the hamlet of Port Severn, and encompasses over 100 acres of property with 700 meters (2000 feet) of pristine waterfront. 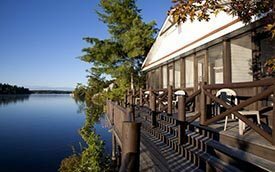 It is situated in a quiet sheltered bay on the northern shores of Gloucester Pool, the western most lake of Ontario’s historic Trent Severn Waterway, and overlooks a spectacular array of picturesque pine clad islands. The view is simply breathtaking, and it is difficult to believe that the resort is just a short distance from the greater Toronto area. Through the years, Severn Lodge has been featured in many publications including 100 Best Family Resorts in North America, What To Do With the Kids This Summer, MacLeans Magazine, Canadian Living Magazine, Toronto Sun and Toronto Star newspapers, various international tour publications that feature Ontario resorts, and various other Ontario resort magazines & websites. The Main Lodge was originally built in the mid 1800’s when it served as area headquarters for the Georgian Bay Lumber Company. Ontario was logged over a 30 year period beginning in the 1840’s, and after the logging era ended, the property was sold to a wealthy social club from Pittsburgh, Pennsylvania that used it as a family vacation retreat. In the early 1920’s a group of investors purchased the resort and opened it to the public under the name of Severn Lodge. To fulfill demand for the increasing number of tourists coming to Muskoka in the late 1800’s and early 1900’s, a number of Ontario resorts were built. Severn Lodge helped fill that demand, and continues to this day catering to family vacations, romantic getaways, meetings & conferences, weddings and more. Family Vacations, Romantic Getaways, & more! Whether it’s just the two of you seeking a romantic getaway or the entire family planning your next Ontario family vacation, at Severn Lodge you’ll enjoy a fun-filled yet relaxing holiday. All inclusive resort vacation & getaway packages feature luxury accommodations with a view of our spectacular waterfront, delicious meals, and a wide variety of recreational opportunities. In the summer months there are supervised activities for children of various age groups along with live evening entertainment for all. Supervised children’s activities are both educational and fun-filled, and children often make friends that last a lifetime. Housekeeping packages, where a meal plan is optional, feature accommodation in cottages & suites, all with a waterfront view, and include the same recreational opportunities as the all inclusive packages. In addition to being one of the premier holiday and vacation resorts in the Muskoka – Georgian Bay area, Severn Lodge is one of its’ premier conference resorts and has been a favorite meeting place for nearly a century. Whether your meeting is an executive retreat, a training session, a sales conference, or an educational workshop, Severn Lodge is the perfect meeting & conference resort. Our secluded setting and spectacular views provide the ideal environment for productive meetings. Conference packages feature waterfront accommodations, fine country dining, and use of our meeting & conference facilities. Additional meeting rooms or breakout rooms are available upon request. Severn Lodge provides a host of other meeting services including a dedicated meeting & conference planner, use of our audio visual equipment, various business services, and a host of recreational opportunities including team building activities. The entire resort including delegate accommodations and meeting rooms is serviced by our free wireless internet network. Ontario resorts, and particularly Muskoka resorts, have traditionally provided a very romantic place for weddings, and at Severn Lodge, a timeless tradition of classic, memorable, and romantic weddings has evolved over the years. Your Muskoka wedding is very special for us too, and we will attend to every detail so that you and your guests will enjoy this very special day. Wedding packages include the onsite services of our Group Sales Manager, private use of the entire resort and wedding facility, a very special wedding ceremony, reception and dinner followed by an evening of dancing. The bride and bridal party can even arrive for the ceremony in our historic 37’ Ditchburn mahogany motor launch. What can be more romantic! You can even have a romantic honeymoon at Severn Lodge in one of our deluxe cottages complete with Jacuzzi whirlpool spa and fireplace. Accommodations for all inclusive resort packages are housed in various lodges surrounding the Main Lodge. Some are individual Muskoka cottages while others are housed in multi-unit Muskoka lodge buildings, each with their own private lakeside entrance. There are several accommodation styles including traditional hotel rooms, two bedroom suites, and individual cottages. Some have Jacuzzi whirlpool spa tubs and/or fireplaces. In addition to these accommodations, there are individual rental cottages and suites with kitchens. Over the years Severn Lodge has gained a well earned reputation for delicious meals, popular wines, and gracious country hospitality. All meals are served in our Main Lodge Dining Room where guests can enjoy a view of our magnificent waterfront. Menu items are both regional and international, and are carefully selected to ensure a delightful variety of choices. Guests can also choose from a wine list that features selections of the most popular international and Ontario VQA wines. We feature fine country dining with a family friendly atmosphere. Severn Lodge offers a host of resort recreation facilities including an outdoor heated swimming pool, whirlpool spa, sandy beach & lake water swimming, water trampoline, tennis, shuffleboard, volleyball, basketball, horseshoes, games room, 100 acres of wooded hiking trails, and more. In addition, you can enjoy a variety of waterfront sports & recreation including water skiing & tubing, boating, sailing, canoeing, pedal boating, kayaking, stand-up paddle boarding, fishing, outboard boat/motor & jet-ski rentals, mountain biking, and boat cruises in our historic 1922 Ditchburn motor launch! Our surrounding Muskoka – Georgian Bay countryside is filled with many interesting things to see and do including golf, live summer theatre, museums & historic sites, antique and craft shops, theme parks, festivals & fairs, boat cruises, Las Vegas style gambling at Casino Rama, and fabulous shopping in our nearby lakeside villages of Bracebridge, Gravenhurst, Orillia, Barrie, Midland, Penetanguishene, Bala, and others. Guests from outside Ontario will also find the many exciting attractions of Toronto only 90 minutes away. In addition to meetings, conferences & weddings, Severn Lodge has been host to many other types of groups including family reunions, anniversaries, company or association getaways, incentive travel holidays, motor coach or senior bus tours, etc. Tour packages with group rates are individually designed to suit each individual group. Severn Lodge has been owned and operated by the Breckbill family for nearly a century, and we are dedicated to providing the highest standards of hospitality, comfort, and personal service. We hope you will enjoy our web site, and if you have any questions, please do not hesitate to contact us. We look forward to having you as our guest.